For over a decade, I flew as a jump-pilot during my time off in the weekends! Picking up skydivers and releasing them over 12000 feet higher... a flying elevator! I've always been very close to the skydive community. Being brought up at a small local grass strip in Belgium, these were the guys I was hanging out with. And seriously, this was some of the best fun I had in aviation! And no, before you ask, I never jumped, read; dared to jump. Why would you do so, out of a perfectly fine aircraft? Over twenty years later, I'm still going back to the same bunch. Earlier this week, I had planned to shoot at Skydive Dubai. More specific the new remote Desert Campus drop-zone, called SD2 (Skydive Dubai 2 on the Dubai-Al Ain road) which is primarily used by student skydivers. Since the original DZ (drop-zone) at Dubai Marina, surrounded by water and high rise buildings is surely not the best training environment the decision was made to open a second campus in the Dubai desert. 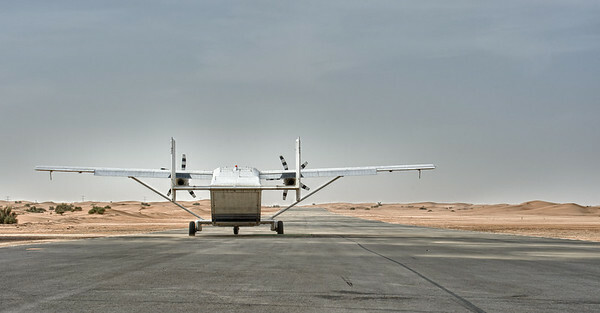 A deserted Short Skyvan was parked on the runway, which is the old Dubai-Al Ain road! The "shoebox with wings" as this British build twin turboprop aircraft is nicknamed, was the largest jump-plane I flew in the early nineties. It learned me a lot as a pilot and it was like catching up with an old girlfriend. Only her, me and the howling wind! As I was photographing the scene, it reminded me of a camel I photographed a few years ago, on a road in the Dubai desert. Click here for the image. Time permitting feel free to stroll through my Jump-planes and Skydiving gallery. 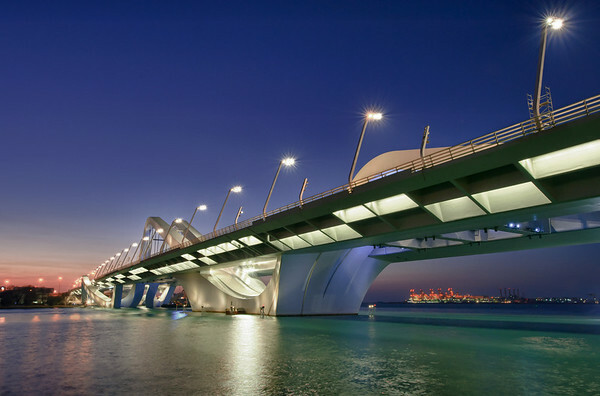 After almost 8 years of construction, the third bridge over the Maqta channel in Abu Dhabi, UAE, opened for traffic last October. The beautiful wave form 842m long bridge, designed by the Iraqi born, world famous architect Zaha Hadid, is named after the former president of the UAE, Sheik Zayed. It has been labelled by engineers as one of the most difficult bridges ever built. The initial lighting concept was designed by Rogier van der Heide at Hollands Licht and was further designed by a large international team at Arup lighting. As a photography tip; to have the starry look around the lights shoot at a small aperture of f16 or f22. Before the now well documented Sun ' n Fun 2011, I spend a day at Fantasy of Flight (FoF), near Polk city, halfway between Orlando and Tampa, Florida USA. 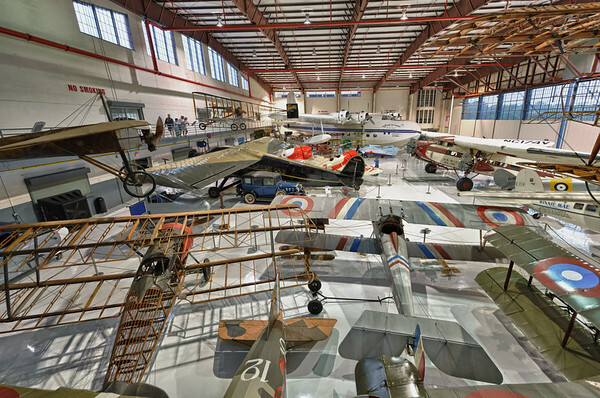 FoF is not your average aircraft museum. 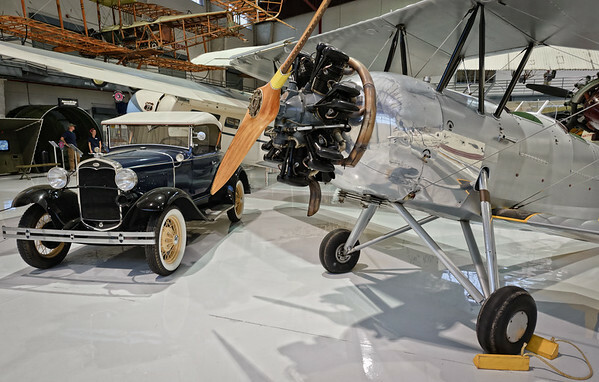 The owner, Kermit Weeks, twice US National aerobatic champion and a huge aviation enthusiast, actually wants it to be called an aircraft collection. And what a collection it is! With over 60 aircraft based at Polk city and many more all over the world; he owns the worlds largest vintage aircraft collection. FoF opened at its present location in 1995 after a lot of aircraft were destroyed by hurricane Andrew at its previous location near Miami. Most aircraft are either in flying condition now or are being worked at to be taken to the skies again in the future. Even though on the day I was there the weather did not cooperate, on fair weather days, an aircraft is taken out of the hangar and is flown in front of the public on a daily basis. As Kermit once said, "museums are for dead things"! 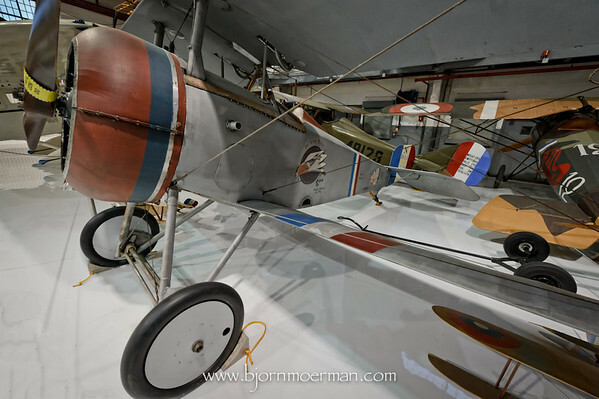 Beside having a close look at all the aircraft on display, one is taken on various tours like a visit to the wood workshop and the restoration hangar. 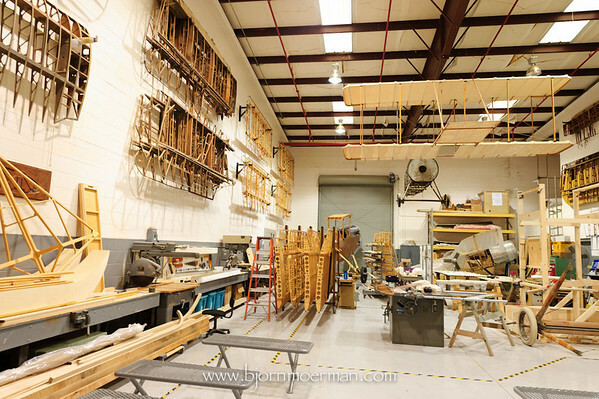 All of it makes for a very lively experience, a Florida aviation theme park! 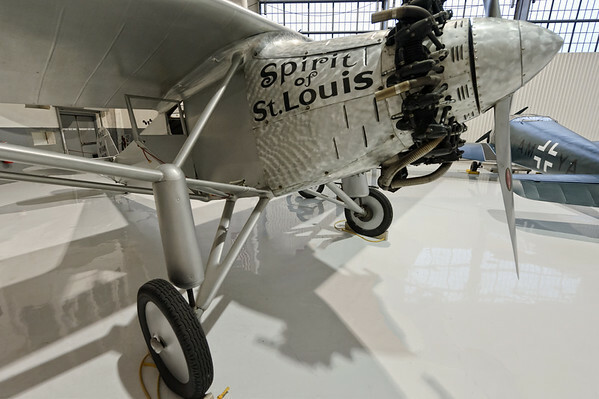 Replica of the Ryan NYP, "Spirit of St Louis" flown by Charles Lindberg. 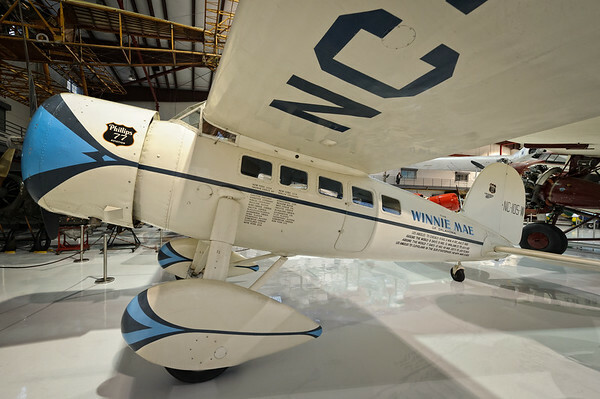 Original 1929 Lockheed Vega, restored to Wiley Post's "Winnie Mae" colors. 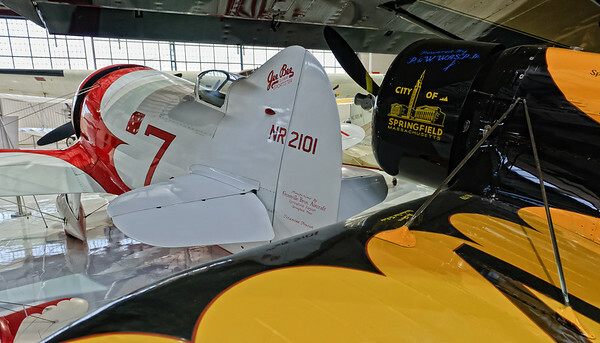 Pair of flying replica Gee Bee 1930's racers. Unfortunately both of the single built original planes, crashed in the 30's. For more info on Kermit Weeks and his amazing collection, follow his blog or read through an interesting article at the Airport Journals. Hope you enjoyed this (virtual) visit as much as I did last March. 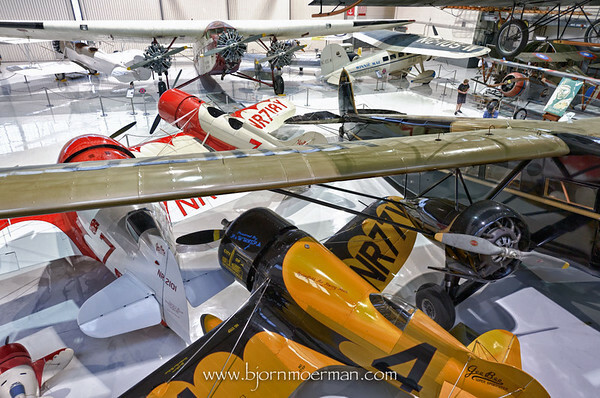 If ever you are in the neighborhood, this is a "must" see for each and every aviation enthusiast! Last Wednesday I was down in Abu Dhabi for an architectural client shoot of the Aldar Head Quarters (HQ) at Al Raha beach. Even though I've been a regular visitor to the site, it was the first time I photographed the finished building. The 110m unique round design, consists of a steel structure with hundreds of glass triangles. Because of the special shape, most triangles have a slightly different dimension, which made it a very interesting engineering project. Even National Geographic made a documentary on the Aldar HQ wind tunnel tests and a short video of it can be found here. Some of my earlier images of the Aldar HQ building process can be found here. While a second gallery shows part of this weeks shoot. Sun 'n Fun 2011, "Spring break for pilots"
Even though my Sun 'n Fun fly-inn visit was dominated by bad weather, I will not make this post into another tornado one. My Pic(k) of the week 14 covered this a few days ago. The weather did cause disruptions to the daily airshow on the first three days. Unfortunately the day I had to leave the weather cleared and I missed the demo of the Blue Angles, the world famous jet team of the US Navy flying F-18's. I did photograph them before at the Reno Air Races in 2009. 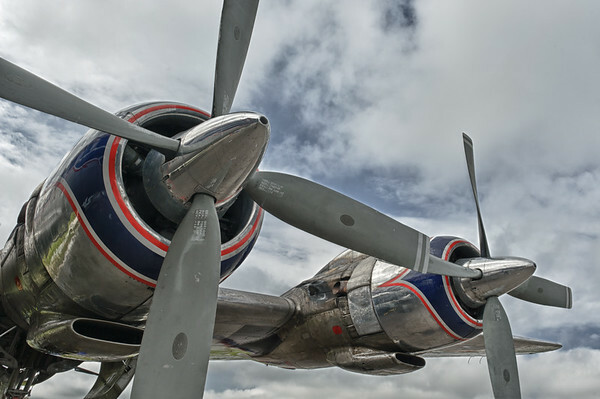 Because of the above, I concentrated on shooting static vintage aircraft and warbirds. In the end, I did come home with some interesting imagery. One of my personal highlights was a visit to the one and only flying DC-7B operated by the Historical Flight Foundation. The amazing story of the restoration which took over 6 years can be found here. 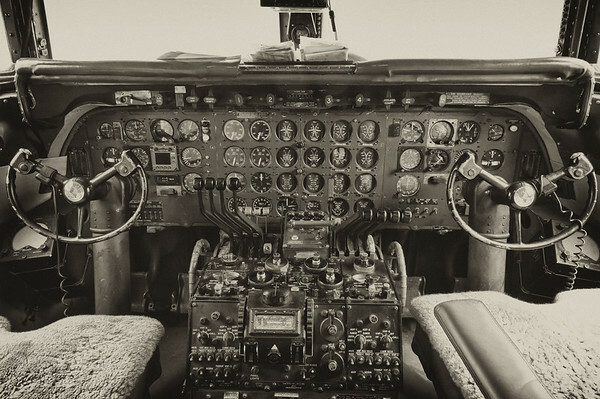 Shooting the cockpit of this 1950's prop-liner, which is almost fully original, I felt the urge to give the image an antique look. 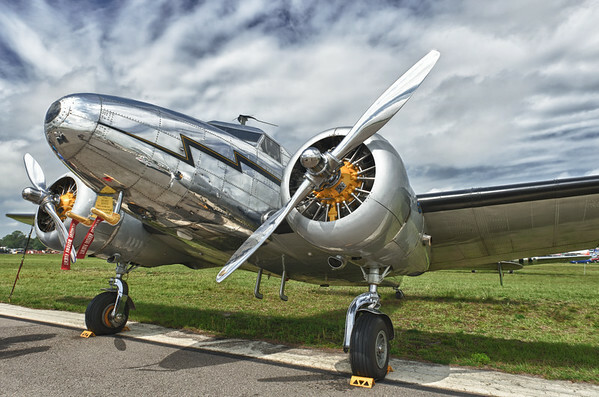 Another beauty queen was this Lockheed 12A used in the movie Amelia. 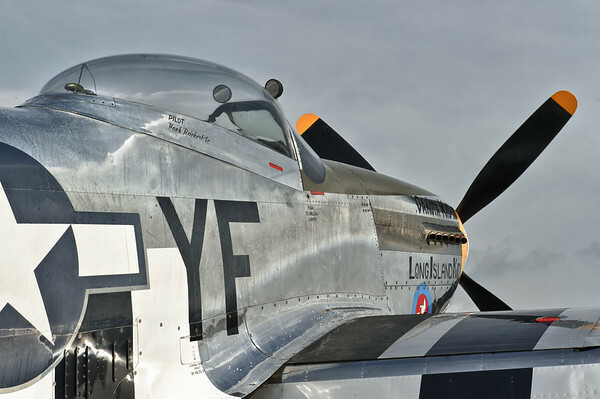 The nasty weather didn't ground WW II warbirds like this P-51D Mustang. It continues to amaze me how dedicated the owners of some of the aircraft are. 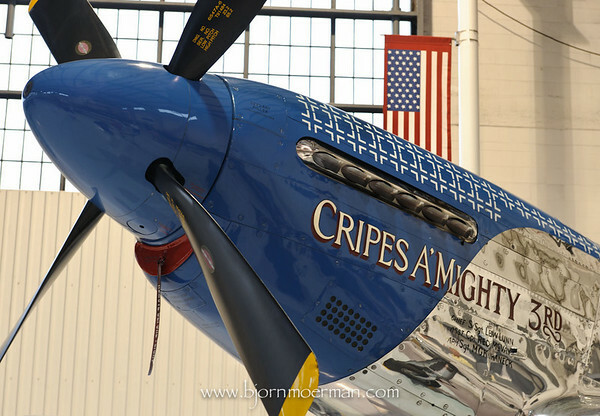 Hours of polishing paid of, after this Corsair F-4U won the "Grand Champion post-WWII price. 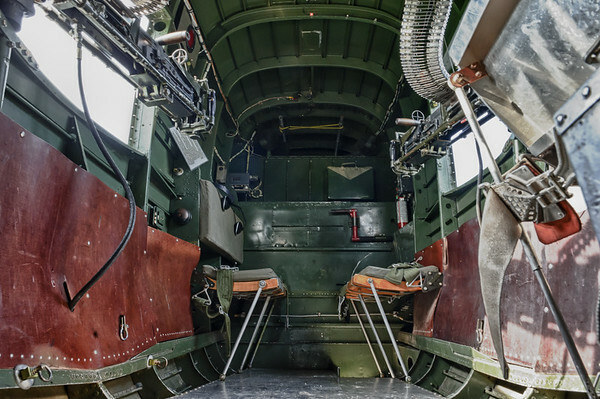 They try hard to keep these flying machines as close as possible to the original, such as the (non-loaded) machine guns in the back of this B-25 Mitchell bomber. 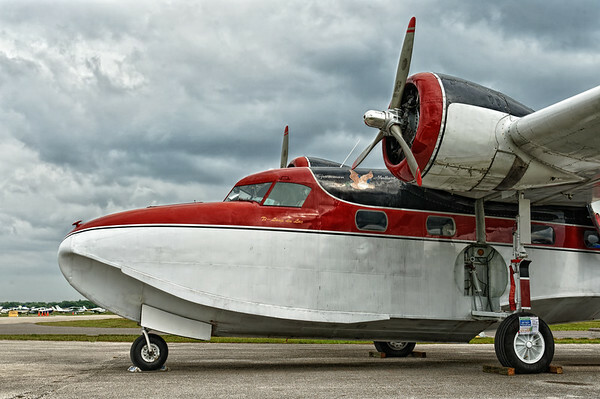 Given the amount of rain in the first days of Sun 'n Fun, seaplanes like this Grumman Mallard almost didn't need the surrounding lakes to be in there element! 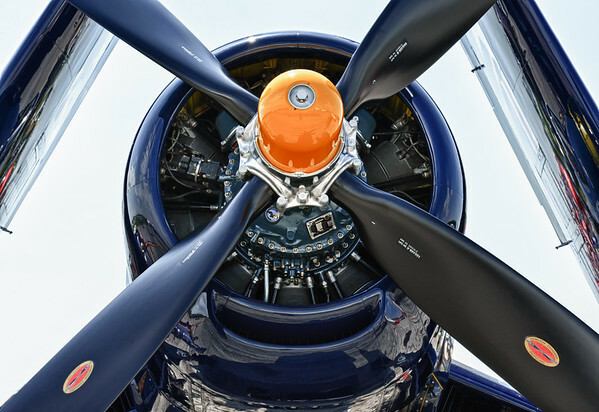 Because of a limited attendance due to the weather, it is hard to make a fair comparison between the Spring Break for Pilots (Sun 'n Fun) and the even larger event up North, "Air Venture" in Oshkosh, WI. I do however believe that if one puts in the effort to travel over 8000 miles (13000 km) and needs to pick one; Air Venture wins! 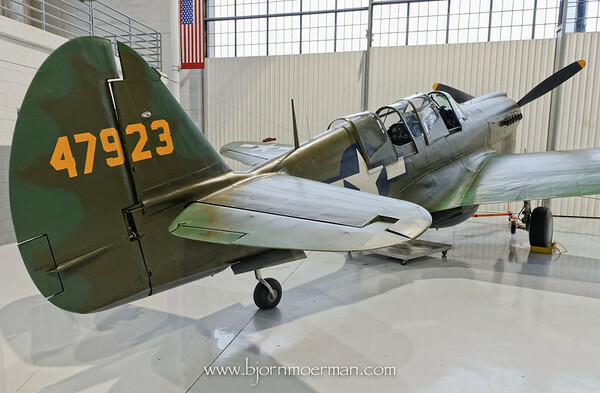 Expect another post on a neighboring aviation museum in the next few days. Those of you following me on Facebook and Twitter probably know that I had my first real life tornado experience last week... Just before lunchtime on March 31st, a tornado damaged and/or destroyed about 70 aircraft at the Lakeland airport during the annual Sun 'n Fun fly-inn in Florida. Fortunately there were no life threatening injuries and the organizers managed to continue with the event for the remaining three days. The whole experience of seeing multiple crippled aircraft was heartbreaking for a general aviation enthusiast as myself and I purposely decided not to take any images of the mayhem. One of the aircraft that was destroyed last Thursday, was Tony Spicer's homebuilt RV-3B. I photographed this beautiful single seat aircraft less than 24 hours before the tragic event and feel incredibly sorry for his loss. 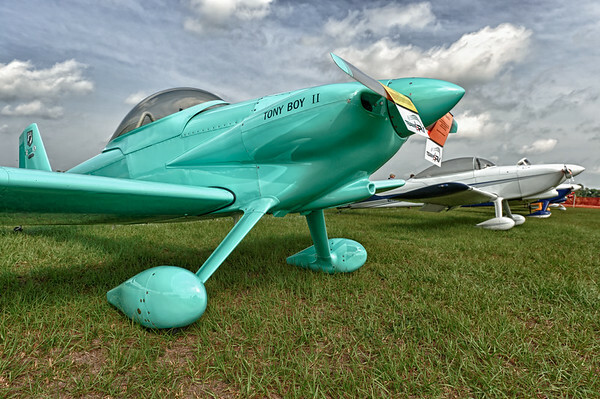 Tony spend thousands of hours over several years building Tony Boy II, named after Tony's dad P-51 Mustang " Tony Boy" which he flew during WWII. 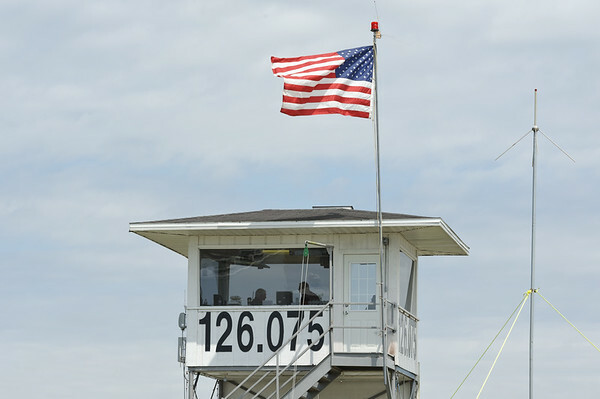 He flew his Van's RV-3B as the crew chief of Team RV, the world's largest air show team! On a public announcement Tony said: " These things happen for a reason. I have unfortunately not found what it is...". A short video clip of Tony talking about his loss can be found here. Those of you interested in a meteorological explanation of the tornado that struck Lakeland, click here. Needless to say that there are many more sad stories about last weeks natural disaster at Sun' n Fun! My thoughts go out to each and all of you!